In a small bowl, combine the cornstarch and sugar. Stir in the water, soy sauce and sesame oil until smooth; set aside. 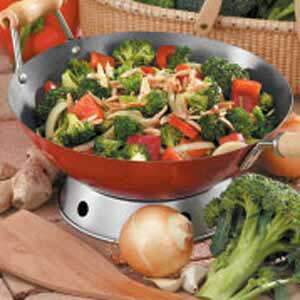 In a large nonstick wok or skillet, stir-fry broccoli in hot oil for 3 minutes. Add the pepper, onion, garlic and ginger; stir-fry for 2 minutes. Reduce heat; stir the soy sauce mixture. Stir into vegetables along with nuts. Cook and stir for 2 minutes or until thickened. Hi Erika, just want to mention that this this looks amazing!! I haven’t had much practice cooking with almonds, so this would be a great starting point! Now that looks super healthy!